In telling the story of the moment, every astrologer filters her perception through the lens of her chart. Every astrologer begins where his chart begins. I am no different. I am noticing that this New Moon Solar Eclipse at 17 degrees Aquarius occurs one degree away from my natal Moon at 16 degrees Aquarius. The Moon is personal energy, emotional energy, I feel poised for change and wonder from which direction it will come. Eclipses are times when the light goes out – suddenly – in contrast to the normal rhythm or pace of things. The light goes out and then it comes back – quickly. When any eclipse occurs, I prepare myself for change. When an eclipse occurs conjunct a natal planet, I prepare myself for a major shift in how I see myself and the path I am taking in this life. It is very difficult to predict whether one will experience an eclipse positively or traumatically. And it is hard to tell myself or anyone else, that even though it is scary to be plunged into the darkness of an eclipse, the light does return. The sudden return of light, which I compare to rebooting a computer, is the defining energy of an eclipse, not the darkness. Where does the new light shine? What new paths open up? Where do I go from here? If 16 to 18 degrees Aquarius is significant in your chart, then that advice may be particularly helpful for you. Communication and community are major themes for this lunation. Aquarius is the sign of community and communal processes, like elections, like communal agreements, like ways that a group makes decisions. Aquarius is also the energy of change, revolution, and the future. Super Tuesday, the day that the two major parties are supposed to know through their primaries and caucuses who their next candidate for president will be, will happen the day before the Solar Eclipse during a time when Mercury (god of communication) is retrograde and Pluto, newly in Capricorn, is opposing Mars at its stationary degree of 24 Gemini. This energy is interesting, and very unpredictable. Of the four major candidates, Clinton, Obama, Romney, and McCain, only Hillary Clinton has a planet within the degrees of this eclipse. Her Venus is at 16 degrees Scorpio squared to Aquarius. 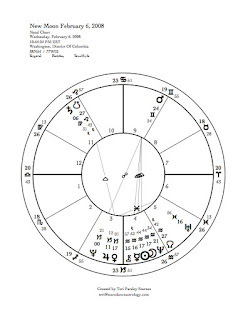 Interestingly, Obama’s Venus is being impacted by the Pluto ingress into Capricorn. His Venus is at 1 degree Cancer opposed by transiting Pluto. (Source of chart information is from The Mountain Astrologer Dec/Jan 2008). Venus describes our attractiveness. Both of these candidates are transforming in this area of their lives — unpredictably (eclipse) for Clinton and powerfully (Pluto) for Obama. Every community needs clear communication. Mercury (16 degrees Aquarius) is retrograde at the time of this New Moon. This will be a good month to rethink our communication methods in our communities. Chiron, the Wounded Healer, is next to Mercury at 15 degrees Aquarius. Do you carry wounds from past experiences with community? Most of us do. We have the opportunity to offer our wounds to the altar of healing, to make choices that bring compassion as well as fairness into our communities. As this lunation strikes close to home for me, I am noticing that I want to change old patterns around my relationship to my communities. Eclipses happen around the Nodes of the Moon. The North Node is now in Aquarius and the South Node is in Leo. The growing edge (North Node) supports any work we do around community and authenticity. Right now, our karmic baggage comes from Leo (South Node). Questions about our self worth, — how our communities need us — are important to explore in order to be free of this baggage that keeps us from our authentic roles in community. Pluto in Capricorn and Mars retrograde continue to be very important themes to the current story. See previous blog entries for these themes. Mars has turned direct, and is now completing his hero’s journey. During the return, Mars will be asking us to integrate our experiences of the heart since September. The “hero’s return” portion of the story goes on till April 4, when Mars reaches 12 degrees Cancer, the place it stood to turn retrograde. At the New Moon, Mars is in Gemini. On March 4, it will reenter Cancer and oppose Pluto in Capricorn. This is the third time that Mars opposes Pluto during this Mars retrograde cycle, and this is the first time that Mars opposes Pluto from the polarity of Cancer and Capricorn (the previous two times were in Gemini and Sagittarius). This will be a time of stirring up the core issues of Pluto’s transit into Capricorn. Already financial concerns are strong which is stimulating survival concerns. We have the opportunity to use this energy to realign our priorities, to reinvigorate our ambitions while staying rooted in the heart of compassion. The Full Moon on February 20 is a Lunar eclipse that will be visible in much of the United States. The principles of a Solar Eclipse apply to a Lunar Eclipse but with less intensity. Solar Eclipses can be event-oriented while Lunar Eclipses tend to impact the emotional realm. The Moon will be at 1 degree Virgo (the Sun at 1 degree Pisces). The very mental energy of Aquarius is still strong at this time, however a new practicality is required to bring balance. How do we serve the visions that occurred at the New Moon? Saturn is next to this Virgo Moon reminding us that true change happens when we take only the next step, then the next, then the next. February 24, the Sun opposes Saturn – a day to bring heaven to earth and earth to heaven. How will be serve our highest ideals rather than our basest instincts? In the midst of winter, seeds of change stir deep underground. How will you help create the change that you envision?